Here’s what wave and tidal developers had to say about improving the cost of energy (CoE), at the recent All Energy Opportunities conference. There were some interesting pointers to where the technology is heading. Andrew Scott described production scenarios for the first Pelamis wave farms. He discussed how the choice of where components were made and assembled impacted the CoE. Pelamis have developed a pontoon facility so that quayside access is not required for maintenance. Presently quayside access is not a problem, but it will add costs if future versions of the Pelamis are greater in length. Another anticipated design development is increased tube diameter, which could make road transport (fitting under bridges) difficult. Andrew suggested a ‘hub and spokes’ approach, where the specialist components, such as the joints, were assembled at the Edinburgh facility, while the individual tubes were manufactured closer to the location of each array. The future production scenarios were for the next generation of Pelamis: the P2e (e for enhanced). Andrew did not specifically say that the images shown were the final design, but they nevertheless give a good indication of the direction in which Pelamis is heading. In diagrams where the P2e was compared side by side with the existing P2 design, there were several noticeable differences: there were 6 tubes rather than 5, and each was a similar length to the P2 tubes, apart from the end tube, which appeared longer. The overall length was given as 190m-215m, compared with the 180m of the P2. This suggests to me that the option of 5 tubes has not been ruled out. The cross-sectional profile is elliptical rather than circular. Both major and minor radii are greater than the radius of the P2, and the eccentricity is roughly that of a hen’s egg. The diagrams gave me the impression that the P2e had roughly double the displacement (wetted volume) of the P2. The rating of the P2e is 1MW, as opposed to the 750 kW rating of the P2. These developments are particularly interesting to the wave energy industry as a whole, as they are the outcome of Pelamis’s CoE optimisation drive. Pelamis have more operational and design iteration data than any other wave developer, and such data is essential for formulating and validating a reliable CoE model. My interpretation of how these design changes relate to CoE is the following. Given the larger displacement but similar length of tube, Pelamis are aiming to improve power capture across the full range of wave periods. There might be more of an improvement at middle to longer periods than at shorter periods. Given the large increase in displacement relative to the modest increase in rating, Pelamis are also aiming on increasing the capacity factor. In other words, they are intentionally sizing their PTO units so that they are producing more annual energy per unit capital cost. It is also worth noting a recent paper by the Pelamis team that suggested better performance, due to improved hydrodynamic interaction, from a greater number of bodies. At the quickfire seminar series, Andrew reported on the progress of the testing of two P2 devices in Orkney. Without going into too many details, he mentioned the following figures: steady output of 270kW achieved for half an hour, and peaks of 455kW generated. The peak outputs do not seem high, but the P2 devices are still in the later stages of their working up program, and did not generate in the 10% of sea states that were the most powerful. Nevertheless, with an output capability averaging 100kW for the EMEC resource (see website), this suggests a capacity factor (ratio of rated power to average power generated) of 7.5. As the next generation of Pelamis is designed for a higher capacity factor, this suggests that Pelamis’s cost models indicate that the optimal capacity factor is higher than 7.5. It is interesting to note that there were a few wave energy start-ups presenting technology based on similar principles: a modular array of interconnected buoys, which each had 6 DoF, and with PTO (power take off) from the relative movement between two neighbouring buoys. Albatern described tank and loch (Scottish lake) testing of their Squid concept. Each module consists of a ring of 6 surface-piercing buoys, with alternating deep and shallow drafts. The Wavenet design involves a hexagonal grid made up of Squid modules. Oleg Dmitriev (VERT labs) also presented a system for building interconnecting arrays from hexagonal building blocks. The VERT lab hexagonal unit consists of 7 identical shallow draft buoys: one in the centre and the other 6 forming the hexagonal outline. The 40South Energy concept consists of a floating shallow draft buoy, and two completely submerged tubular bodies, positioned upstream and downstream from the buoy, parallel to the wave front. Power is extracted from the relative motion of the submerged and floating bodies. The floating body is connected to each submerged tube at two points, so that power can be extracted from relative rotations. There are suggestions for extending this concept to larger arrays by attaching several floating buoys to one pair of submerged pipes. This was a strategy cited as an important driver for CoE by several speakers. Neil Kermode (EMEC) advised developers to put installability at the top of their design priorities. Mark Hamilton (Scotrenewables) said that their tidal stream technology had been designed around the installation vessel, which costs ~£3 000 per day to hire, rather than ~£1 million per week for a dynamic positioning vessel. Ken Street (Alstom), speaking about the TLG turbine, said that the installation vessel size is key. The use of a buoyant turbine that could be towed to site rather than lifted off a barge with a crane allowed the use of cheaper installation vessels. A limiting factor to the installation of their recent test device at EMEC was the size of the local ferry: the turbine fitted on this with just millimetres to spare. Joseph Fison (Atlantis), speaking about their ETI cost reduction project TEC, said that they’d calculated that installation costs could be halved by designing to avoid bespoke vessels. Anne Van Houten (Bluewater) said that the main reason their floating tidal turbine support structure would be cheaper than a seabed support was the cheaper installation vessels required. Michael Ottaviano (Carnegie) described how CETO had been designed with installation in mind. It is towed out fully assembled. Presently divers guide the mating process, but this will be designed to be done without divers. Although a large jack-up barge is required to install 3 piles for mooring connections, a smaller vessel is required to tow and connect CETO to the moorings. Cheap removal and reconnection keeps down O&M costs. A couple of developers mentioned cost savings that could come from spreading the costs of some types of equipment over several generators. Joseph Fison (Atlantis), said that results from the ETI project TEC indicated that costs could be reduced by sharing power electronics plant between 8-18 turbines. Anne Van Houten (Bluewater) mentioned the cost saving potential of shared mooring points. Win Rampen (Artemis Intelligent Power), speaking in the Offshore Wind 3 session, was asked how the choice of whether to test in laboratories or at sea impacted the overall technology costs. Although his reply referred to offshore wind, it was applicable to wave and tidal, and echoed sentiments in a recent paper on development trajectories for wave energy. Win said that to reduce the cost of learning, it is important to learn as much as possible using low-cost testing methods. He stressed that offshore testing should be reserved for ‘learning that can only be learnt offshore’. Iann Todd (European Offshore Wind Deployment Centre) described how centrally funded testing facilities could reduce industry-wide costs. An offshore wind park is planned for Aberdeen, and, if they can overcome the legal challenge from Donald Trump, this should bring significant benefits to the offshore wind industry. As well as a being test facility for state of the art 5-7 MW wind turbines, and for novel foundations resulting from a Carbon Trust competition, the program includes a scientific monitoring program, and development of technology to counter the effects of wind turbines on radar. These programs have the potential to benefit other wind farms that have been delayed because of concerns about radar interference or environmental impact. I was very impressed by the vision and pioneering spirit of this project and am optimistic that something similar could be done for wave energy. There were indications of an increasing interest in alternatives to seabed-mounted support structures for tidal steam turbines. This will be of interest to wave developers, because similar cost and engineering issues arise. Anne Van Houten (Bluewater) described the company’s 30 year experience of designing and operating both bottom-mounted and slack-moored (floating) service buoys for the oil and gas industry. They estimated lifetime cost savings of 30% for the floating buoys. Based on this experience, Bluewater are marketing a generic floating platform for tidal stream turbines. The platform looked not too dissimilar from Scotrenewable’s floating platform. Mark Hamilton (Scotrenewables) reported on a successful 18 month test campaign at EMEC for their 250 kW prototype. Michael Todd (Tidal Stream) showed designs for their floating platform ‘Triton’, again intended for mounting tidal stream turbines. This is not slack-moored, as the platform is connected by a rigid strut to a single point mounting on the seabed. However, this connection allows rotation, so the platform is impervious to tidal range, and is self-aligning. He said the single point mounting concept was well proven, and was widely used in the oil and gas industry, e.g. for floating production platforms. He believed the strength of this concept was due to the loads being near the seabed and in shear, rather than in bending, as is the case for a turbine on the end of a pole fixed to the seabed. 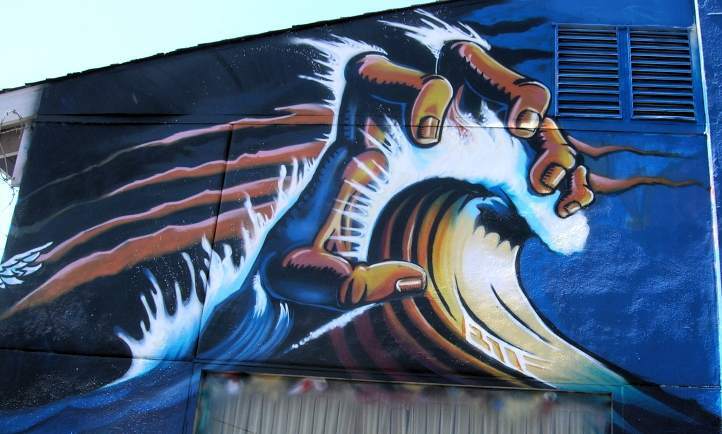 The ‘Hand Wave’ is a design by Californian surf and skate artist Jim Phillips. A tribute to his work was commissioned by a local skateshop, Bill’s Wheels. The mural is tagged ‘ESTE’. Slides from Conference now online. An interesting summary of some of the key presentations at All Energy. On the subject of support structures: Obviously the design of the structure must support ease of installation and maintenance and ideally optimised for the location, in shallow or deep waters and slow or fast tidal flows. Whilst a support structure design may be perfectly suitable as a single device installation, consideration must be given to its utility as part of large array.